Chants about 1500 year old massacre of Khaybar Jewish population chanted at rally organized by Hamas operative. 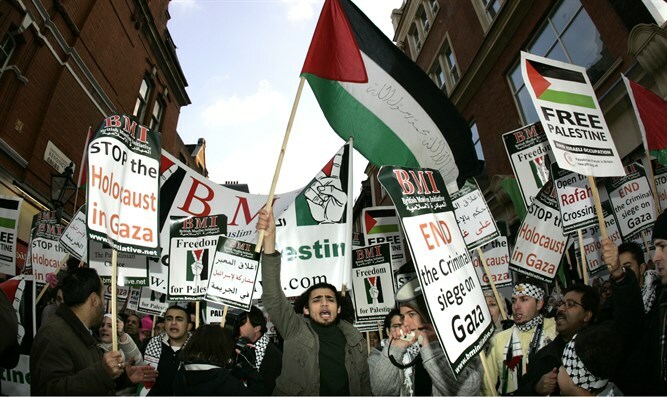 JTA - Participants in a rally in Rotterdam that was co-organized last month by a Hamas operative and promoters of a boycott against Israel shouted in Arabic about killing Jews, leaders of Dutch Jewry said. The incident occurred on July 22 during a rally advertised by a newly-formed organization called the Palestinian Community in the Netherlands, or PGNL, according to a statement Wednesday issued by the Dutch Central Jewish Board. The Rotterdam branch of the Boycott, Divestment and Sanctions movement, which also advertised the event on its Facebook page, was the real organizer of the rally, according to the statement. Participants in the rally, which was to protest the use of security measures by Israel around the Al Aqsa mosque following a deadly terrorist attack there, shouted in Arabic: “Jews, remember Khaybar, the army of Muhammad is returning.” The cry relates to an event in the seventh century when Muslims massacred and expelled Jews from the town of Khaybar, located in modern-day Saudi Arabia. The event, including the anti-Semitic chants, were broadcast live by the Shebab News Agency, an organization banned by the Palestinian Authority over its alleged ties to Hamas. The Jewish board filed a complaint with police for racist incitement to violence, the statement read. Earlier this year, a Belgian court convicted a Palestinian Arab who shouted the same words in 2014 in Antwerp. Leefebaar Rotterdam, a right-wing faction on the Rotterdam city council, asked last month in a query to the mayor to specify what measures will be taken against the people who shouted about Khaybar at the Rotterdam event. The municipality gave no concrete answers. The Central Jewish Board wrote in its statement that the incident in Rotterdam underlines the need to formally apply in the Netherlands a definition of anti-Semitism that includes demonization of Israel – a move undertaken since last year by the United Kingdom, Austria, Romania, the European Parliament and the International Holocaust Remembrance Alliance, or IHRA. The rally in Rotterdam is among “examples that demonstrate why the Central Jewish Board is a strong supporter of giving also in the Netherlands a juridical status to the definition,” the organization wrote. “We regret very much the outgoing cabinet’s announcement that it would not do this,” the statement also read.